In a refrigerant system the function of compressor is to change …………………. Which of the refrigerant has no ‘drop-in’ replacement gas? The temperature difference of refrigerant is across condenser is almost constant. Which of the following oil used for use with R-22 refrigerant system? Which of the following refrigeration system component converts high pressure liquid in to low pressure liquid? Which of the following compressor should not be operated when there is a vacuum in the system? The refrigerant storage tanks are painted …………………..
HFC’s have no ozone depletion potential because ………………………….. Even for small appliances EPA requires to repair leaks with in 10 days. A DOT classification tag should be there on refrigerant cylinder for ……………. Ozone molecule in stratosphere consists of …………………… atoms. What is approximate oxygen percentage in atmosphere? 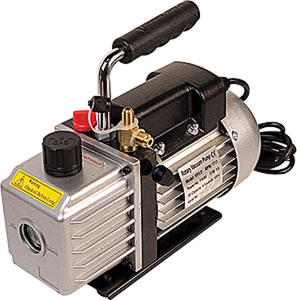 The vacuum pump can be assisted in refrigerant recovery in a passive system with an inoperative compressor. But the refrigerant container should be non-pressurized because vacuum pump can handle pumping against more than atmospheric pressure. b) Large Vacuum Pump Freezes the moisture in the system. Using too large vacuum pump will freeze the moisture in the system because it causes the speedy drop in the system pressure. When the pressure drops the boiling point and freezing point of water decreases. To remove the moisture a dry nitrogen should be introduced which increases the pressure in system and melts the moisture in to water which can be removed using liquid recovery procedure. In vacuum pulling procedure, the system vacuum gauge should be located as close as possible to system tubing and as far to the vacuum pump. This increases the accuracy in pulling vacuum using vacuum pump. By this method continuous monitoring the system pressure will reduce the effect of moisture freezing.